Both designs show the central part of a gigantic mausoleum on a segmental plan with a deep, round-arched entrance approached by a long and wide flight of stairs. The walls and openings are decorated with huge urns and sculpture that dwarf the tiny mourners. Interestingly drawing 4 shows two colonnaded storeys of equal height above a base, that is, a three-storey building with presumably dome and drum. 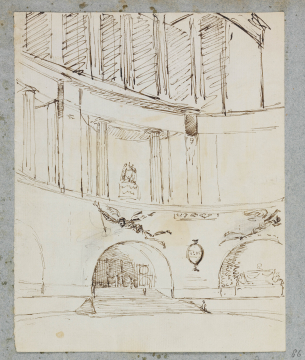 Soane's final designs are for a three-storey mausoleum. Drawing 5 has striking bracketed pedestals for sculpture and Greek Doric is used for both designs. du Prey attributed drawing 4 to John Flaxman but here it has been re-attributed to George Dance; drawing 5 is by the same hand. The stylish skeleton figures of Death, and of Winged Victory, as well as the draughtsmanship and the dramatic expressiveness of the design do suggest George Dance. 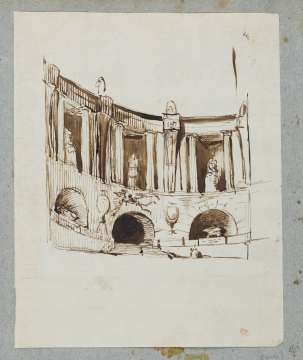 In any case, the hand is certainly not Soane's for as Margaret Richardson (February 2008) commented: 'the sketches are very three-dimensional (which Soane's tend not to be)'.